Indian birds › Common barn-owl › Mountain scops-owl - Otus spilocephalus. The mountain scops-owl (Otus spilocephalus) belongs to the family of true owls, Strigidae. These owl species are distributed in Indian subcontinent, South China, Indochina region, Southeast Asia and Indonesian Islands. 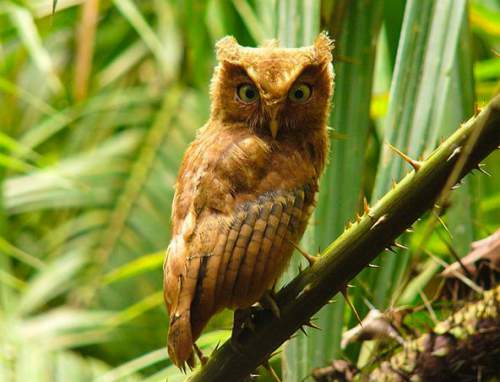 There are eight recognized subspecies of these mountain scops-owl species. They inhabit montane evergreen forests. 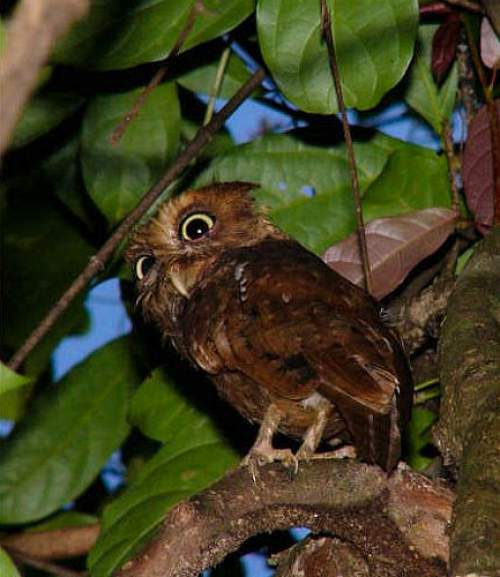 The eight recognized subspecies of mountain scops-owl are: O. s. luciae (Sharpe, 1888), O. s. vandewateri (Robinson & Kloss, 1916), O. s. vulpes (Ogilvie-Grant, 1906), O. s. siamensis Robinson & Kloss, 1922, O. s. hambroecki (Swinhoe, 1870), O. s. latouchi (Rickett, 1900), O. s. spilocephalus (Blyth, 1846) and O. s. huttoni (A. O. Hume, 1870). The species Otus spilocephalus is considered close to species O. balli, O. alfredi, O. angelinae and O. longicornis. The mountain scops-owl is a small bird, measuring 15 to 20 cm in length and weighing 50 to 120 grams. The plumage varies widely among the subspecies. The nominate subspecies has orange-brown-rufous plumage. The facial disc varies from being whitish to light rufous with light brown bars. The ear-tufts are not prominent. The juveniles are pale brown with streaked wings. Their call is a piercing, “plew-plew” sound. These owl species are distributed in the evergreen, montane forests of the Oriental region, which includes Indian subcontinent, southern China, Indochina, Southeast Asia and Indonesian islands. The mountain scops-owl subspecies O. s. huttoni is distributed in Himalayan foothills in Pakistan, India and Nepal. The subspecies O. s. spilocephalus is distributed in Nepal, Northeast India and Northwest Myanmar. The subspecies O. s. latouchi is distributed in North Thailand, Laos, Southeast China and Hainan province (China) in the South China Sea. The subspecies O. s. hambroecki is distributed in Taiwan. The subspecies O. s. siamensis is distributed in Thailand and Vietnam. The subspecies O. s. vulpes is distributed in Malay Peninsula (Southern tip of Thailand and Malaysia). The subspecies O. s. vandewateri is distributed in Sumatra Islands (Indonesia). The subspecies O. s. luciae is distributed in Borneo Islands (Indonesia). The mountain scops-owl ecosystem includes evergreen, montane forests predominantly with chestnut, oak, pine and Rhododendron species. The diet of these owl species mostly consists of large insects like cicadas, grasshoppers, mantises, beetles and moths. They have been observed to feed on small rodents, lizards and birds. The breeding season of mountain scops-owl is from March to June in India and Pakistan. They nest in tree hollows and abandoned woodpecker nests. The nest is unlined. The clutch may contain up to five eggs. These owl species are mostly sedentary and are residents in their range. Post breeding dispersal of juveniles takes place. In the Himalayas, these mountain scops-owl species descend to lower ranges and valleys in winter. They may make local movements for feeding and breeding. The global population size of these mountain scops-owl species has not been quantified. The overall population trend is considered to be stable. They have an extremely large range and population. These owl species do not approach the thresholds for population trend criterion and the population size criterion. Hence considered not "Vulnerable" to extinction. The IUCN (International Union for Conservation of Nature) has categorized and evaluated these mountain scops-owl species and has listed them as of "Least Concern". Current topic in Birds of India: Mountain scops-owl - Otus spilocephalus.